On the final night of competition at the 2003 World Aquatic Championships in Barcelona, Alexander Popov mounted the blocks for what would be his final major championship win. The 31-year old Russian sprinter had already done it all in the sport. He’d won back to back Olympic gold medals in the 50 and 100m freestyles in 1992 and 1996, the only swimmer to accomplish the feat. He broke the world records in both events while repeatedly swatting away up-and-comers to the sprint events for well over a decade. When Popov dove in on July 26, 2003 and exploded to the surface on his way to gold in the 50m freestyle, he did so with his trademark precision and grace. Champion swimmers make the sport look easy—and Popov’s somehow made it look even easier. He took just 31 strokes—in a brief, no cap and from an old-school start—to smash the world record in the 50m freestyle in 2000 in a time of 21.64. Under the watchful eye of his longtime coach Gennadi Touretski, Popov would regularly swim 5,000m straight freestyle. Touretski avoided doing drills in practice, placing an emphasis on swimming “slow” but with excellent form and target stroke rates at all times. Popov’s stroke didn’t change from training to competition. The same effortless looking technique he used on race day was the same balanced, high-elbow catch that he brought to practice every day. There was no distinction. There wasn’t practice swimming or competition swimming. There was only one stroke. The effect of all those meters with perfect technique in practice was that by the time Popov got up on the block, he didn’t need to think about what he wanted to do. He didn’t need to worry about his stroke collapsing, or choking, or planning how he wanted to feel in the water. It was just a matter of diving into the water and letting his body do what it had done a million times in training. Popov’s habitual technical excellence was such that he could regularly swim at world-record setting pace in training. Literally. Story goes that at a pre-Olympic training camp in Colorado Springs Popov got up on the blocks for a surprise “get up” 50m effort. The coaches in attendance—including USC’s Dave Salo who later talked about the occurrence, clocked Popov on a stop-watch at a time that was 0.10 seconds below the existing world record. Popov trained the way he raced. And he raced the way he trained. How many swimmers can say the same? Are you training the way you want to compete? 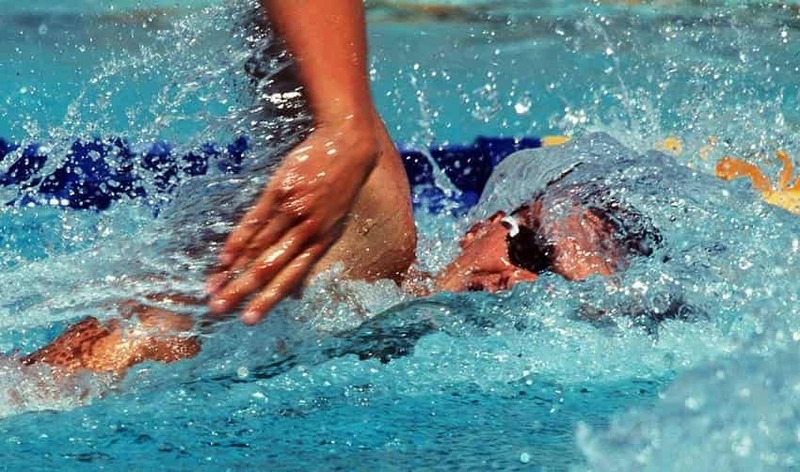 There is frequently a disconnect between the way swimmers train and the way that they compete. The technique they use in practice is different from the one they use in competition. The way they attack (or don’t) the walls in training doesn’t match up with the turns they need to be successful in competition. The streamlines a swimmer does during the main set doesn’t reflect what kind of streamlines they want to use on race day. Even the mindset they have is different: in practice they are loose and unfocused. In competition they try to get super focused and mega serious. It’s one of the reasons that swimmers choke under the bright lights: the experience of competing is so different from what they experience in training that it is overwhelming. The competition experience is so totally and utterly new that they cannot help but feel overwhelmed. It’s no wonder that many of the swimmers I talk to complain about overthinking when they get to the big meet. This is a default reaction when we are face to face with an unpredictable, foreign and pressure-packed environment. We second doubt our preparation because it doesn’t line up with what we want to do in competition. Training the way you want to race puts all of your technical elements of your swimming—the way you attack the walls, the breathing patterns you use, the manner in which you explode through your breakout—and puts it on auto-pilot. When you step up on the block you shouldn’t have to think about your stroke. You shouldn’t have to imagine what your breakout is going to feel like. You don’t need to wonder if you will nail those turns or not. Those habits have long ago been ingrained and the tracks laid down. All you need to do at this point is clear your mind and swim, your body and your training habits will take care of the rest. Practice isn’t separate from competition. Practice is competition. Here are some keys for making this work for you. Prepare the same way for practice you would for competition. How do you compare the approach you take to practice compared to competition? For most swimmers, in practice we are chill, easy-going, relaxed—no pressure because hey, if this practice goes poorly, there’s another one tomorrow. But with competition, there’s only one chance, one heat of our best event, one chance to smash that personal best time. Start viewing each day’s practice as an urgent opportunity to improve, and start viewing competition as simply another practice on your journey. Do the same dynamic warm-up. Eat the same meals. Use the same stretching routine. Do visualization over the course of the day in the same way you would at a meet. Taking practice more seriously blunts the scariness of competition. There’s no such thing as “garbage yards.” There are only focused yards, and unfocused yards. This is one of the terms that swimmers like to throw around when they are given a set they don’t immediately understand, or usually when they have to do a set that they don’t like. But garbage yardage is blind to volume: a 25m sprint done with brutal technique is just as garbage as a 5,000m straight done with poor technique. The only thing that is garbage is the mental approach you take to those meters and yards. Sweet, coach gives you a 4,000m main set when you are a 100m sprint specialist—does that mean you need to do 4,000m worth of crappy turns? Loose streamlines? With mediocre technique? While there are examples of truly garbage-yardage sets, there’s always an opportunity for you to improve something in your swimming, regardless of the set. The swimmer who can find something meaningful to work on during the “meaningless” sets finds a way to set themselves apart. Alex Popov was one of those swimmers who was very cerebral with his swimming in practice. He was always thinking about how to be more efficient, toying with hand placement, angle of elbow during the pull, and so on, all so that he could become a better swimmer. He was a scientist with his swimming, and practice was the lab. Caeleb Dressel, the most recent addition to the pantheon of sprint legends, is much the same way. His log book entries as an age group swimmer bordered on long-form essays, with Dressel sometimes hopping out of the water mid-practice to write how he felt in the water. This kind of fast-action feedback loop means that you will be better informed to improve your technique and effort. Log lots of meters with race pace technique. A lot of focus is placed on swimming at race pace. Which is super fair—after all, you want to experience as much time as possible swimming at the pace you want to race at in competition. But swimming a ton of meters at race pace isn’t always feasible, especially the shorter the event. For every other meter you are swimming in the water, how much of an emphasis are you placing on swimming with race pace technique? You know, the same technique that you plan on using on race day? If race pace technique is making up only 10% of your workout, will you be confident that this stroke will be there for you on race day? Each time you step foot onto that cold pool deck you are building a performance. You are sculpting the race you are going to have on race day. You are embedding the habits and technique that will step up onto the block with you. Will the training you do in the pool today reflect the performance you want tomorrow? Olympic Champion Duncan Armstrong on Dreaming Big and Training Bigger. Australian Duncan Armstrong pulled off one of the biggest upsets in the 1988 Seoul Olympics. Here’s how he did it. Swim Like Popov: 5 Lessons from Alex the Great. He is arguably the greatest sprint freestyler in history. Here’s what you can learn from Alexander Popov.